- If playing in a tournament, read all notices given to you by tournament officials. - The holes on the course must be played in order. - Always use your proper handicap. - Make sure you play your own ball (putting a mark on your ball in case someone else is using an identical ball is helpful). - You may not hit a practice shot while playing any hole or hazard. Local rules may apply, so always read each course's regulations. - In stroke play, always make sure your score for each hole is correctly recorded before you turn in your card. - Play must resume except for in the case of an unforeseen event such as lightning, you are ill, or an official tells you to stop play. Match play is different than other golf games in that each hole is played as a separate contest. If you win the first hole you are "one-up" and if you lose it, you are "one-down." If you tie during the first hole, you are "all-square." Match play is every man (or woman) for himself. A match is won when, for example, you are four-up and there are just three holes left to play. Regardless of the length of the game, in stroke play the competitor with the lowest total score for the round wins. The next hole may not be started until the previous hole has been completed (all balls in hole). This game is every man for himself too. Golfers may not carry more than fourteen clubs. Under normal circumstances, you may not change balls during the play of a hole. The exception to this is if your ball sustains damage, in which case you may change the ball after first asking your opponent. 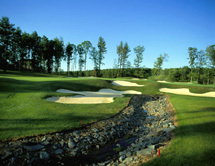 - The player who has the lowest score on a hole has the "honor" of playing his/her ball first on the next hole. - During hole-play, the player whose ball is farthest from the hole plays first. - In match play, if you play out of turn, your opponent has the right to make you replay your shot. This is not the rule in stroke play. 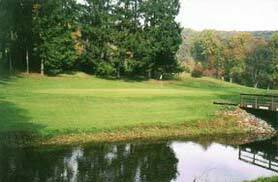 In golf, a hazard is any bunker (area of sand) or water hazard (lake, pond, stream, etc). If leaves or sand cover your ball while in a bunker or water hazard you are allowed to remove enough of the debris to be able to see a portion of your ball. Lifting your ball for identification purposes is permitted anywhere except for in a hazard. You must first notify your opponent before lifting your ball to identify it. - You must play the ball as it lies; you may not move it to a better spot. - You may not improve the position of your ball by pressing down behind the ball. Your club may be grounded only lightly behind the ball. - Bending or breaking shrubbery or other interferences such as tree limbs or weeds is prohibited. - While playing in a hazard, you are forbidden to touch the sand, ground, or water with your club before or during your backswing. - Loose impediments such as leaves or twigs found in a hazard may not be removed, but you may remove obstructions such as soda cans or rakes. - When striking your ball, you must strike the ball with the head of the club. Pushing, scraping and raking the ball are prohibited. - Your ball must be still when you hit it; hitting your ball while it is moving is not allowed. The rules for playing the wrong ball differ for match play and stroke play; the rules for each follow. - In match play, playing the wrong ball results in losing the hole. If you play the wrong ball while in a hazard, there is no penalty, you must resume play by hitting the correct ball. - In stroke play, if you play a ball that is not yours, you are issued a two-stroke penalty. If you play the wrong ball while in a hazard, you are required to play out the hole with your own ball. Failure to do so will result in disqualification. - If either you or your partner move either of your balls on purpose or accidentally, you are required to add a penalty stroke to your score, replace the ball, and then continue with play. - If your ball is moved by someone or something other than you or your partner, there is no penalty, but you must replace it. If natural forces such as wind or water move the ball, you must play it as it lies. - After initial address with the ball, if it moves, add a penalty stroke and replace the ball. - If you move a loose impediment that is lying within one club-length of the ball and the ball consequentially moves, add a penalty stroke, replace the ball, and play it. No penalties are issued while on the putting green. - A "rub of the green" occurs when your ball hits an outside object such as a greens equipment or a bird. No penalty results and the ball should be played as it lies. - If the ball hits you, your partner, caddie, or equipment, you lose the hole. In stroke play, you will incur a two-stroke penalty. - If the ball hits your opponent, caddie, or equipment, you may replay the shot. - If the ball hits a fellow competitor, caddie, or equipment, no penalty is instituted. - In match play, if your ball hits you, your partner, your caddie, or your equipment you lose the hole. In stroke play, you are penalized two strokes and you must play your ball as it lies. - If your ball hits your opponent, his caddie, or his equipment, there is no penalty; you have the option of playing the ball as it lies or replaying the shot. - In stroke play, if your ball hits a fellow competitor, caddie, or equipment there is no penalty and the ball is played as it lies. These are considered the same as outside objects (such as greens equipment or a bird) in stroke play. - If your ball hits another ball and moves it, you must play your ball as it lies and the owner of the other ball must replace it. In stroke play, if your ball is on the green when you play and the ball, which your ball hits, is also on the green, you are penalized two strokes. In all other cases, there is no penalty. - If you are going to lift your ball according to any rule and that rule requires that the ball be replaced, you must put a ball-marker behind the ball before you lift it. - When you drop a ball, stand erect, hold your arm out straight, and drop it. - A dropped ball must be redropped if any of the following occur: it hits the ground and rolls into a hazard, out of a hazard, comes to its rest more than two club-lengths from where it first struck a part of the course, it is nearer the hole than it was originally, or if you are dropping it away from an immovable obstruction like ground repair and it falls back into that same obstruction or ground under repair. If the same thing happens when you re-drop, you must place the ball where it struck the ground when it was redropped. - At any point in which you are permitted to lift your ball, you may clean it. While playing on the green, a ball may be cleaned when lifted except for instances when it has been lifted to determine if it is unfit or for identification purposes because it interferes with play. - If someone else's ball interferes with your swing or is in your line of putt, you have the right to ask the owner of the ball to lift it. - If your ball is lying near the hole and might hinder another player's play, you may lift your ball. - After five minutes of searching, a ball is considered lost. - A ball is deemed out of bounds when all of it lies beyond the inside line of objects such as white stakes, a fence or wall that marks the playing area for the course. - If your ball is lost or out of bounds, you are required to add a penalty stroke to your score and play another ball from where you played your last shot. - If you think your ball may be lost or out of bounds, you may play another ball. This is called a provisional ball, and must be played from the place where your first ball was played. You must tell your opponent that you are playing a provisional ball and it must be played prior to looking for the first ball. If you cannot find your first ball or if it is out of bounds, you are required to count the number of strokes combined between the first and provisional balls, add a penalty stroke, and play out the hole with the provisional ball. If you find your first ball in bounds, continue play with it and remove the provisional ball from play. 3. Choose a location for your new ball within a straight line from your unplayable ball, drop the ball and play. Your new ball must be further back from the hole than the first ball. When teeing your ball, it should be between the tee-markers or a little behind them and as far as two club-lengths behind the markers. If your ball accidentally falls off the tee, you are entitled to replace it without penalty. - If any part of your ball is touching the green, it is considered to be on the green. - When your ball is on the green, you are allowed to brush away leaves and other loose obstacles within your line of putt with your hand or a club, however fanning them with a cap or towel is not permitted. - Ball marks or old hole plugs should be repaired if they are within your line of putt. Marks made by spikes or shoes may not be repaired. - Test the surface of the green by rolling a ball or scraping the surface is not permitted. - When picking up your golf ball to clean it or get it out of another player's way, always be sure to mark it by putting a small coin or other marker behind it. - As long as your ball is not on the green, there is no penalty if your ball strikes the flagstick during your play (provided no one is holding the flagstick). - Do not putt with the flagstick in the hole if your ball is on the green. You should either take the flagstick out of the hole and place it somewhere or ask another player to hold it while you play your ball. In match play, if you putt and your ball hits the flagstick when it is in the hole, you lose the hole. In stroke play, you are required to add two penalty strokes to your score for the hole. - Obstructions are artificial or man-made objects. Bottles, tin cans, rakes, etc., are movable obstructions. Sprinkler heads, shelter houses, cart paths, etc., are Immovable obstructions. - Movable obstructions anywhere on the course may be removed. If the ball moves when moving an obstruction, it must be replaced without penalty. - You may drop your ball away from an immovable obstruction if it interferes with your swing or stance. Find the nearest point not nearer the hole where you can play without interference with your swing or stance. Drop the ball within one club-length of that point. (You may move your ball away from an immovable obstruction if it interferes with your swing or stance.) Note: You should not pick up the ball from an obstruction until you have established the nearest point of relief.